Photography Credit Jasper Sanidad. 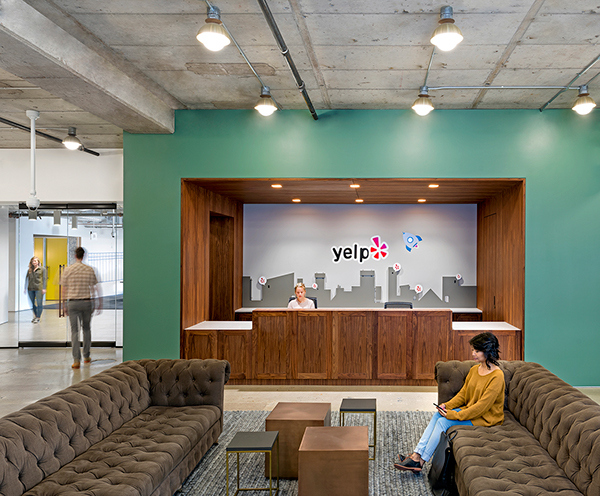 With over 135 million visitors every month Yelp functions like a giant online café where people meet to exchange information and opinions on shops, restaurants, entertainments and service companies. 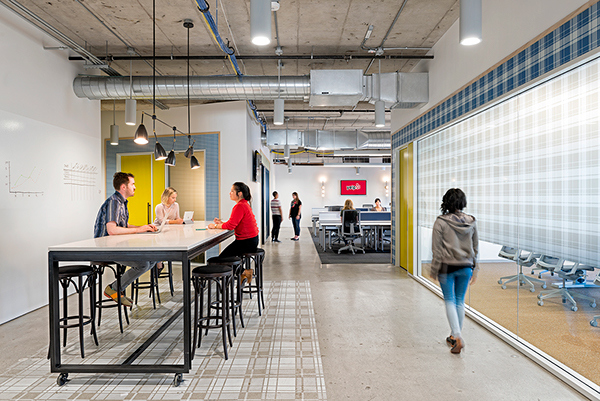 This idea of a common forum for international markets became the design inspiration for Yelp’s offices on Hawthorne Street in San Francisco. 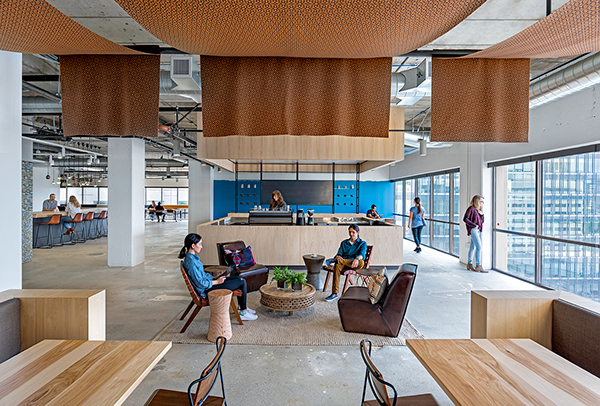 Each floor springs from the textures and moods of a particular market in a city where Yelp has a significant presence: Istanbul, Tokyo, London, Amsterdam. 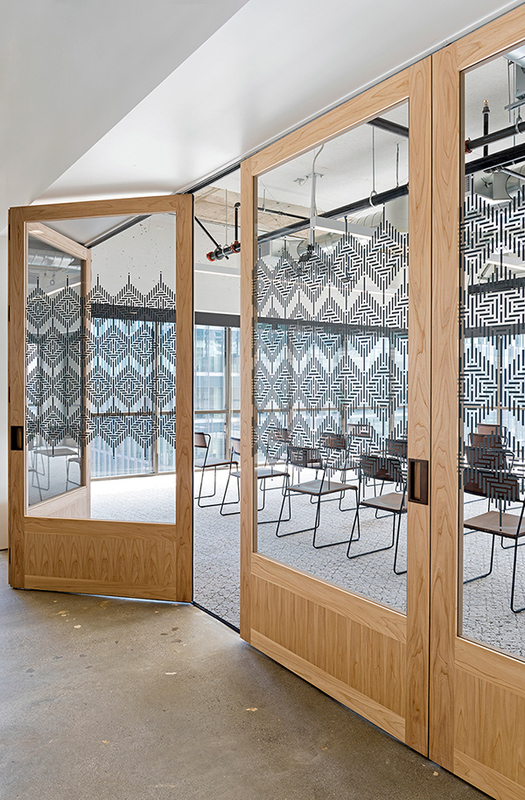 Drawing on the colors and patterns of four ancient cultures—and four markets that have survived for centuries—O+A’s designers created four spaces brought together by the universal impulse to share experience. 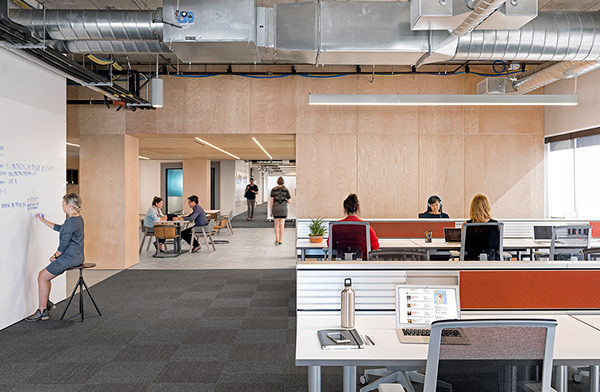 Because regional references in space design can easily be overdone, O+A used the four markets as jumping off points for designs that subtly, rather than overtly, evoke their sources. 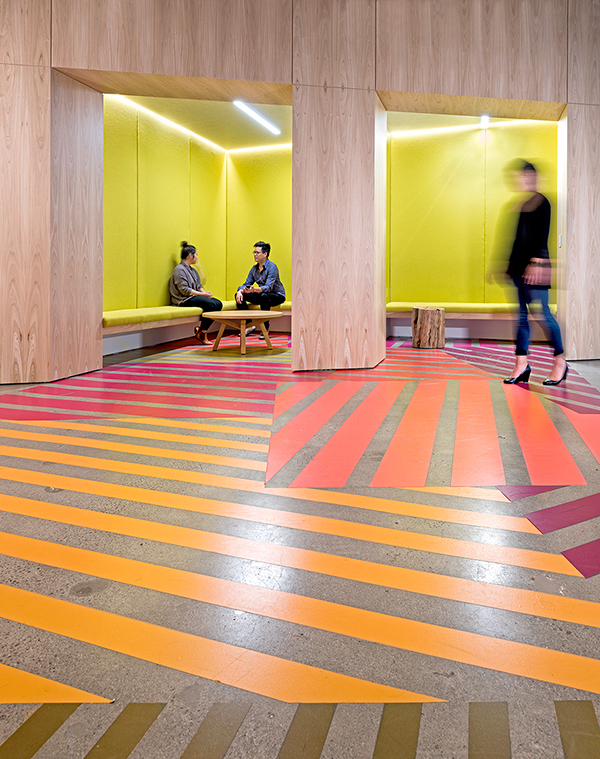 Each space abstracts its country of origin into colors and patterns. 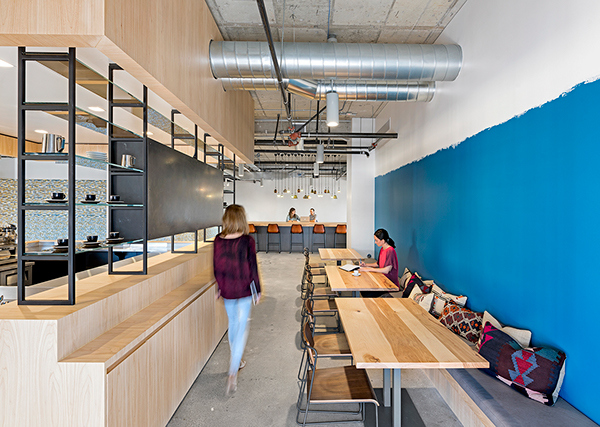 The space inspired by Istanbul’s Grand Bazaar, for example, combines copper light fixtures, hanging textiles and Bosphorous blue accents to create a mood more contemplative than commercial. No one would label this a “Turkish” design, but the nuances of that ancient culture flow consistently through its modern surfaces and textures. 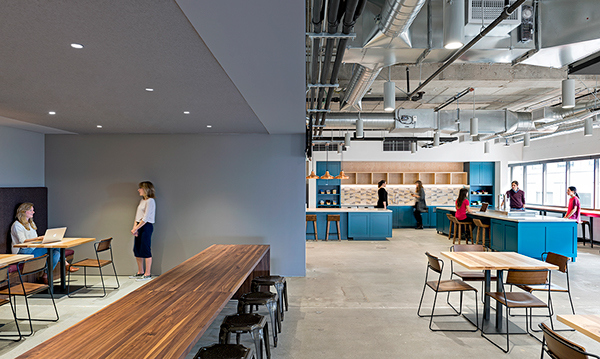 Similarly the space inspired by Tokyo’s Tsukiji Fish Market, betrays no hint of fish—or of Tokyo. The finish and furniture choices here are drawn instead from the traditions of Japanese craftsmanship that make textiles, carpentry or sushi occasions for expressions of character. 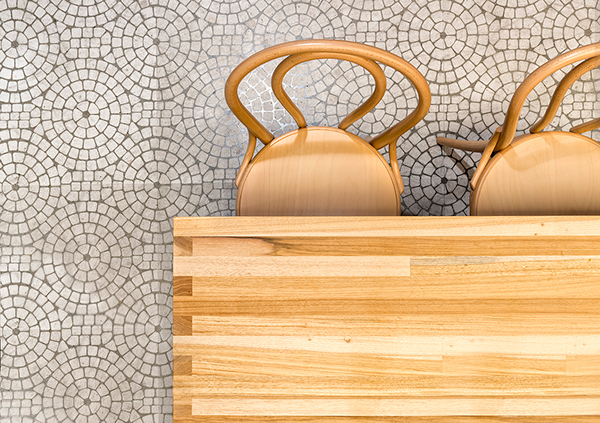 From the joinery of the wood furniture to the patterns etched into raw concrete floors, the values, not the imagery, are identifiably Japanese. 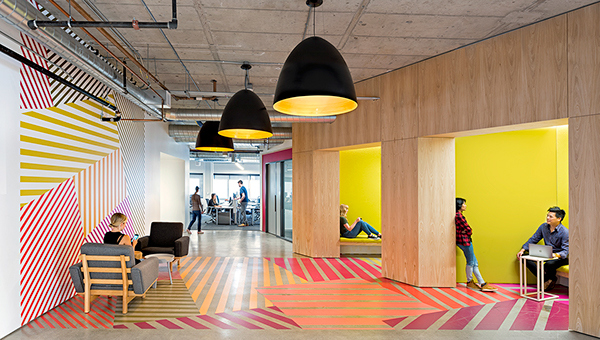 Values are at the heart, also, of the space inspired by London’s Spitalfields Market. 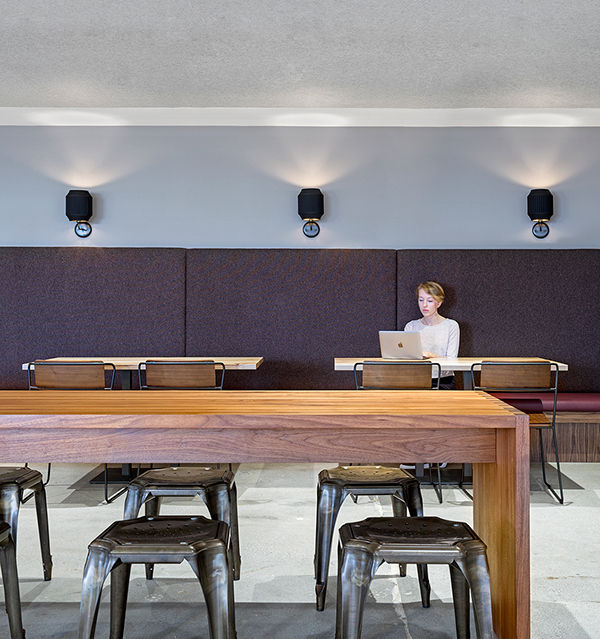 While the tartan wall coverings convey a vaguely British spirit, the impact is not so much regional as generational. Spitalfields is, among other things, a well-known vintage clothing market, a center of funky chic in London’s increasingly trendy East End. 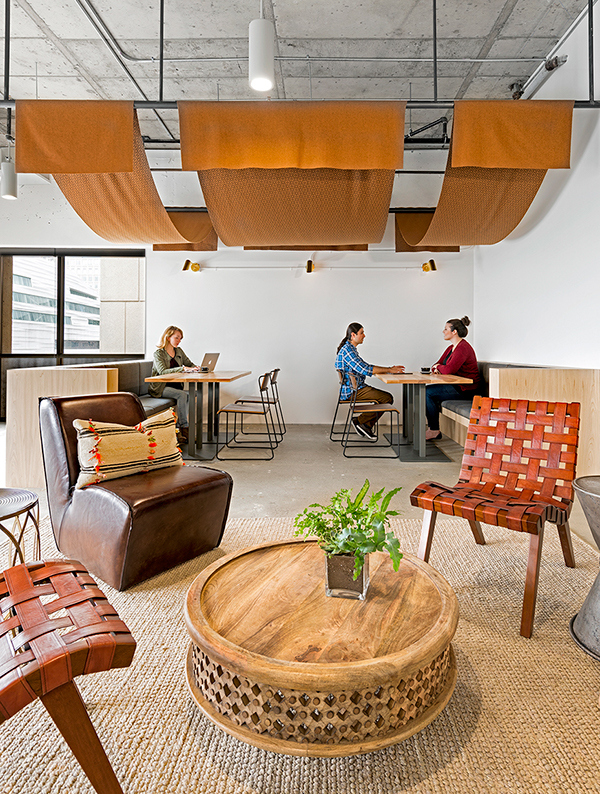 That’s the design echo this Yelp space projects—a culture of informality and comfort, an unpretentious culture of putting old things to new use. 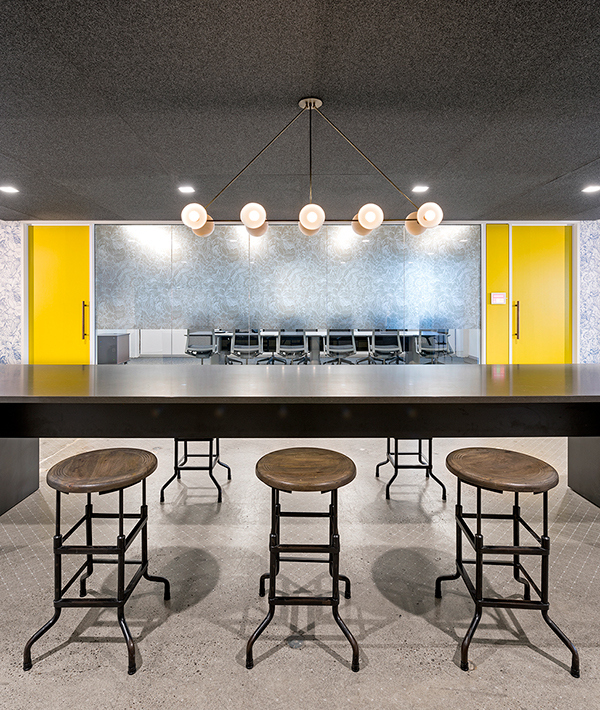 Probably the most literal references in this suite of workplaces are those inspired by Amsterdam’s Bloemenmarkt. Multi-colored, geometrical patterns on the walls and floors clearly reflect the style of Dutch artist Piet Mondrian, but their true source—and the link to Amsterdam’s Floating Flower Market—is the way Dutch tulip fields look from the air. 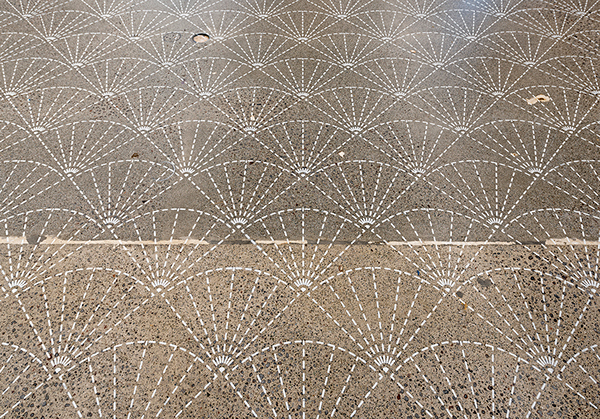 Even with this traceable link, however, the execution is sufficiently abstract to make the space a general expression of ebullience rather than a specific evocation of Dutch culture. 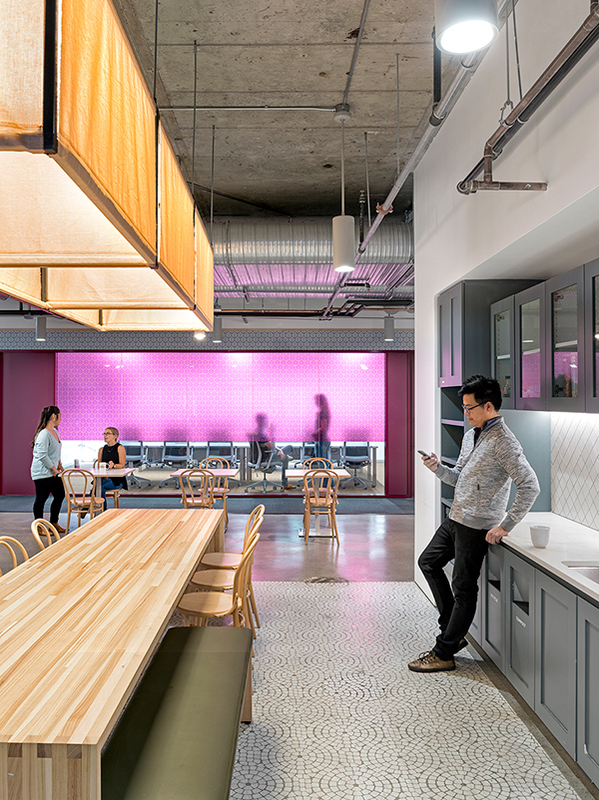 As always with an O+A space, Yelp Hawthorne’s multi-cultural design story threads through an office that provides the functional versatility a dynamic tech company requires. 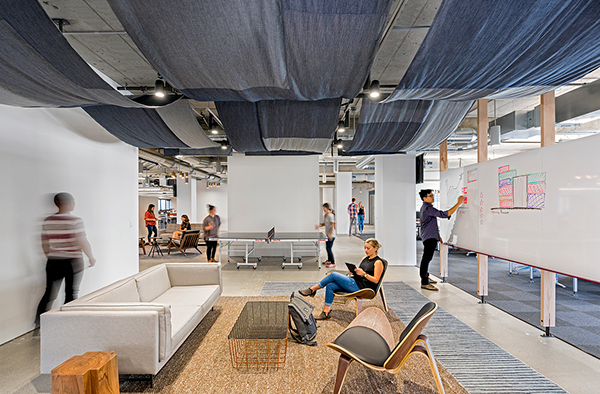 A choice of meeting spaces, both formal and informal, private work nooks, writable white-board walls, café and kitchen areas, lounge areas, adaptable workstations—the necessities of a modern work environment are framed by the global context. 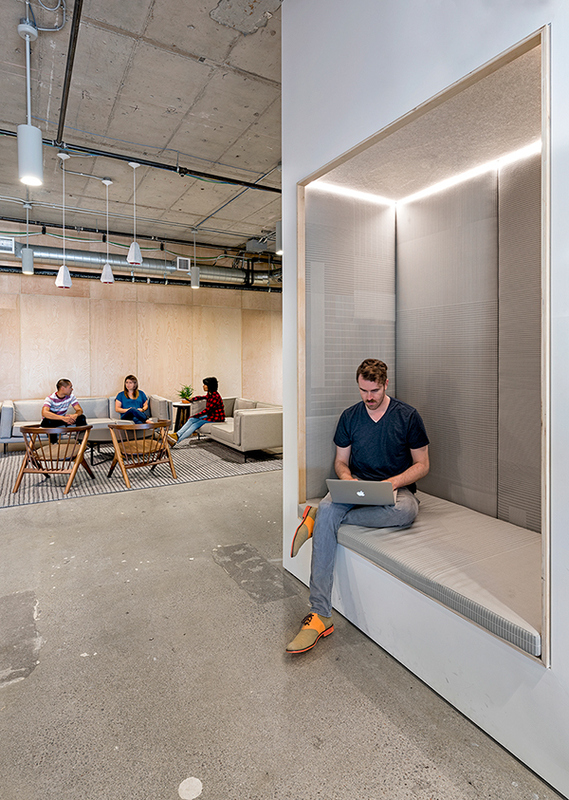 Every Yelp employee in San Francisco reports for work to an office that literally (in the nature of its services) and figuratively (in the design of the space) embraces all the world.